When I evaluate hockey talent there are many skill-based considerations including the obvious stickhandling, shooting and skating. There are also the intangibles including work ethic, coachability, hockey smarts and confidence. Oftentimes the fine line in separating talent comes down to confidence, not only individually, but also as a team. With confidence comes poise and composure, and the ability to perform on the biggest stage under the most pressure. You have heard players and teams described as having ‘ice in their veins’. This characterization is earned, through experience and perseverance. At a recent game a team was down 3-2 and with their goalie pulled and their ‘go-to’ players on the ice, they tactically moved the puck around the offensive zone with precision. They didn’t force anything, but instead waited for just the right opportunity to put the puck on net in the hopes of tying the game. With the clock running down the final few seconds, the top scorer wound up with the puck and just like that, the game was tied. Less than 30 seconds into overtime that same team scored the game winner. Sure, this included a little puck luck, but it was clear to everyone in the building, including the opposition, that this team believed without a doubt that they would tie the game. The players on the ice believed wholeheartedly that they were destined to tie, and ultimately win the game. Not only did the team have the confidence, but individually, the players knew that they had the skill and the will to win. 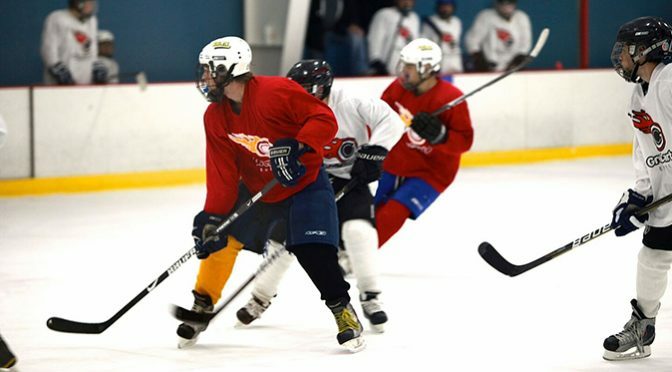 The players knew that all of the hard work and practice time spent shooting extra pucks, working on powerskating, stickhandling and shooting was going to pay off. They absolutely believed that they could achieve. As the playoffs approach do you believe that you will achieve? Both individually and as a team? And once that final buzzer sounds signaling the end of the season, do you believe that you can set goals, work hard this summer and hit the ice next season as a bigger, stronger, more skilled hockey player? We invite you to take your game to the next level at one of our hockey schools located in 12 states this summer. We know that with some great instruction, hard work and dedication, we can help make you a believer, and an achiever! Thanks for reading and good luck the rest of your season!